100 Day Fun! | Mrs. Anton's Class! ← Too Much Number Fun! Yesterday we celebrated 100 Days of School! It is one of my favourite days because it is fun to see how much they have learned in 100 days! The first thing we did was read 100 stories together! When I told them we were going to read 100 stories they were a little surprised and didn’t think it was possible. When I lay out the process they jumped onboard! The children got together in little groups of two or three students. They found a story to read from my collections of books and got together in a cosy spot and read the book together. 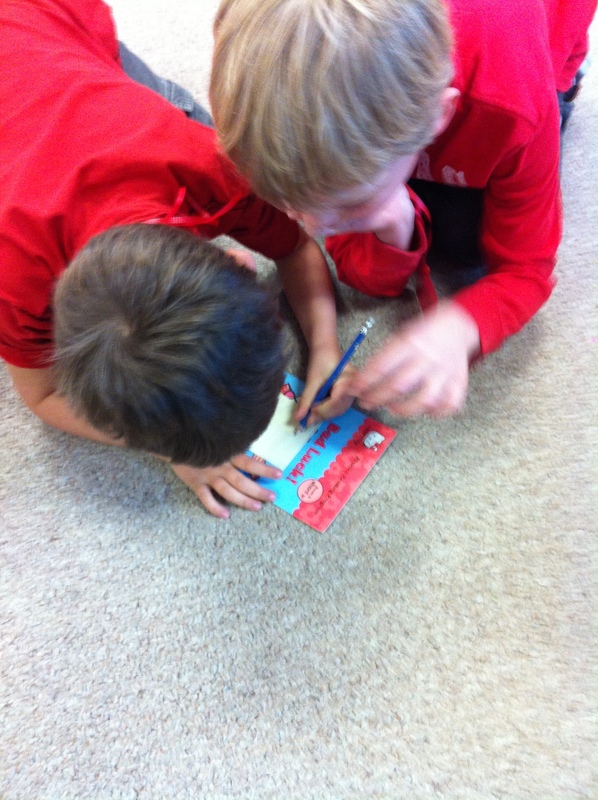 Then they recorded the title of the story on a post-it and signed their names under the title. Then, they put the post-it up on the chart. Working together we read 100 stories in no time at all and the added bonus is that everyone got lots of reading practise too! 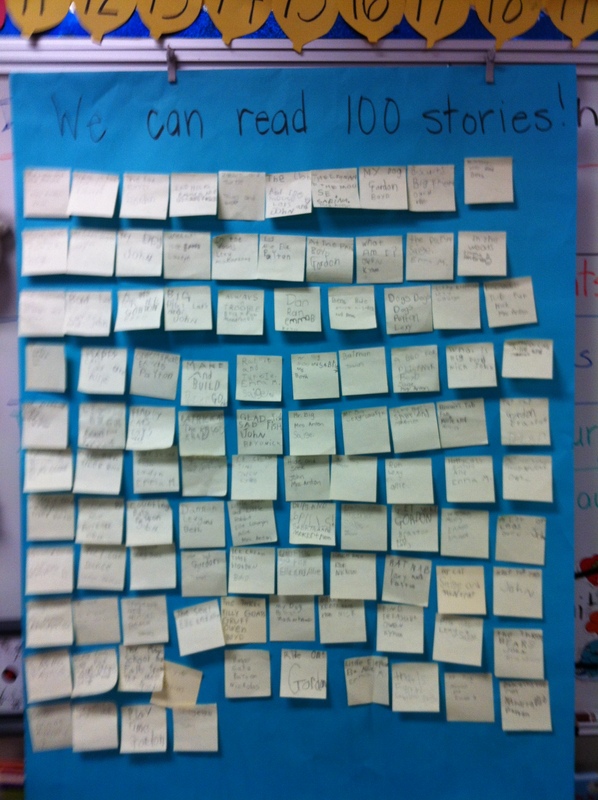 We actually read 104 stories! The children got lots of practise counting to 100. We counted 100 fruit loops to make a necklace and we counted out 10 different kinds of little snack items to make a 100 item snack! Yum! 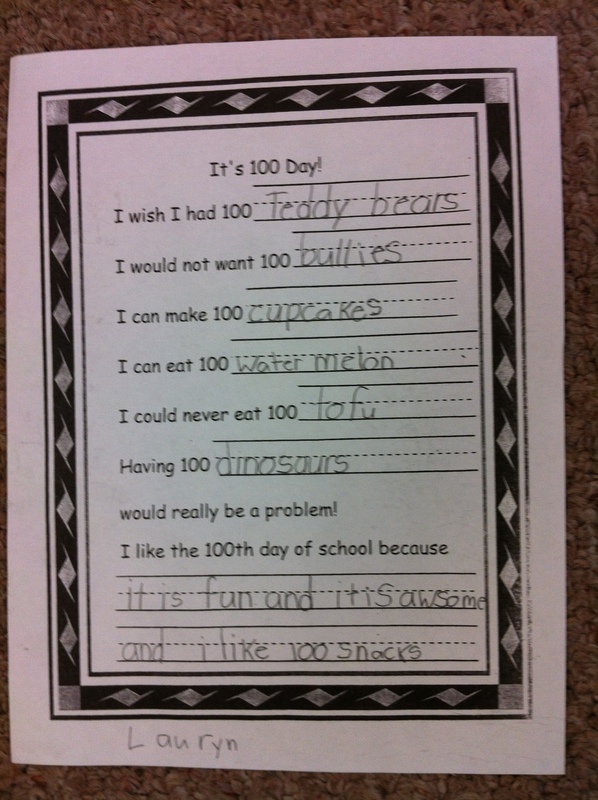 We wrote about 100 too! Having 100 dinosaurs would definitely be a problem! We have been working with place value concepts relating to 100 day and I have managed to put some new links on the WIKI page from the ABC Ya! site. The children tried them out in the lab and seemed to really enjoy them. I am sure they would enjoy showing you at home. The most popular app right now in the class on the iPads is Base Ten Fun! 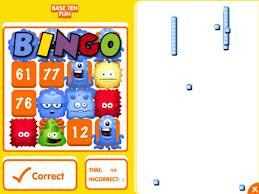 The 100 Number Chart game and Base Ten Bingo can be found on the ABC Ya Site. I have created a link to these games on the WIKI. Check them out! I love getting a chance to get a glimpse inside your amazing classroom. 104 books! Congratulations. We are loving the Base Ten Fun app at home! It is fun, isn’t it!